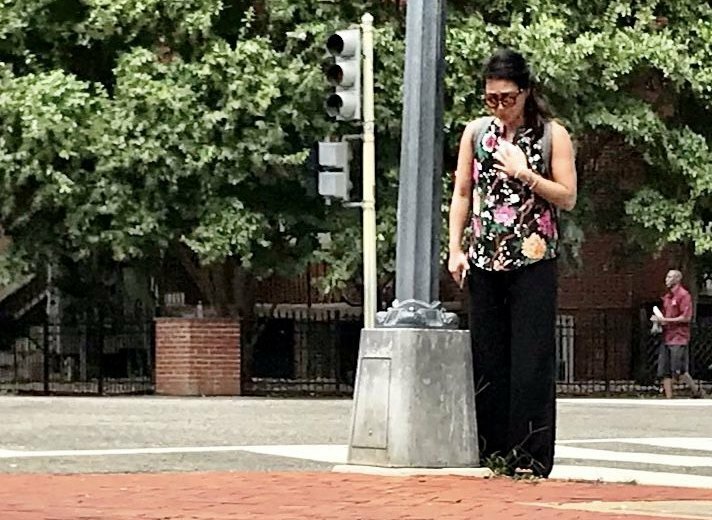 Though D.C. police said Thursday that they didn't have a motive for the fatal stabbing of Wendy Martinez, court documents give some insight as to what happened Tuesday night and who the suspect, Anthony Crawford, may be. Charging documents suggest Anthony Crawford’s own words may come back to haunt him, as he is suspected of fatally stabbing a woman while she was running through D.C.’s Logan Circle neighborhood Tuesday. Crawford, 23, was arrested Thursday and charged with murder in the killing of 35-year-old Wendy Martinez. At a news conference announcing the arrest, Chief Peter Newsham said D.C. police didn’t have a motive for the fatal stabbing, and said Crawford was not cooperating with police. But court documents provide some insight into what happened that night. Police were called to 1439 11th Street NW for a report of a stabbing victim just before 8 p.m. Tuesday. Just before 8:30 p.m., Martinez was pronounced dead in a hospital. In the area where the stabbing occurred, police found a knife covered with what looked like fresh blood and a mustard-colored sweater with possible blood on it, according to court documents. Surveillance footage from the area shows a man wearing a yellow sweater stabbing Martinez. Part of this footage was released to the public through D.C. police’s YouTube page so they could identify the suspect. An autopsy Wednesday revealed that Martinez had seven total stab wounds, mostly to her upper body, including her neck and head, according to court documents. The manner of her death was ruled a homicide. Another witness, who had seen the suspect walking at 11th and P streets minutes before the stabbing Tuesday night, told police the suspect may have been mumbling when he passed by, but the witness could not say for sure. The witness was wary of the man — who was described as about 5-foot 5-inches, and heavyset. The witness walked on but then turned at the sound of some kind of commotion — that’s when the witness saw the suspect and victim “physically engaged” in what looked like wrestling, court documents said. The witness said Martinez was able to break free and run into a nearby Chinese carryout restaurant. At this point, the witness did not see the suspect anymore. The witness rushed to the carryout and saw Martinez on the floor, surrounded by blood. Two men there tried to help her; the witness called 911. The men told the witness that Martinez had been stabbed in the neck. A D.C. police officer also recognized Crawford from another surveillance photo for a theft. A third witness that court documents identified as a close relative of Crawford’s recognized him wearing the mustard-colored sweater because it belonged to the witness. This witness said they had seen Crawford wearing the sweater a couple of hours before Martinez was stabbed. This witness also told police that they saw Crawford later Tuesday night with some kind of bandage on his hand, court documents said. While detectives canvassed a park area at the corner of 14th and Girard streets, where Crawford was said to have frequented, he walked up to them just after 8 p.m. Wednesday. He identified himself to the detectives, and they noticed the bandages on his right hand. When Crawford was taken to the homicide branch, he was yelling and crying, according to court documents. According to police, Crawford waived his Miranda rights, and spoke with detectives. “Detectives never made mention of the circumstances of the homicide for which defendant was being charged. Defendant stated however that the detectives were accusing him of stabbing an individual in the course of the homicide, and in specific a ‘little girl,'” according to D.C. police officer Alexander Vogel, who signed the charging document. Crawford’s street name was “Fatz Gleezy,” according to the witness who said Crawford used K-2 often. Crawford spoke to detectives and when asked about the bandages on his fingers, he told them that he fell down some stairs. But court documents said when investigators examined his injuries, they found ” significant lacerations to defendant’s right hand.” Surveillance footage also shows the suspect using his right hand to stab Martinez. “We feel very confident that we have in our custody the person responsible for this murder,” D.C. Mayor Muriel Bowser said at the Thursday news conference. “It’s unsettling for anyone who lives in this city to see this happen. It’s an isolated incident. I’m sure that doesn’t bring any level of comfort to the Martinez family,” Newsham said.